Friday 5th November to Mon 15th November 2010 - How can we save our planet if we aren't connected to ourselves or to Mother Earth? Join a nature retreat led by Professor of Ecology and Master of Taoism and Buddhism, Professor John P Milton; learn to connect to self via connection with nature. 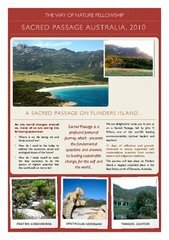 An opportunity to learn from a true Master, in a pristine, natural setting on Flinders Island in the Bass Strait, north of Tasmania. Places are limited and only a few are left. Click on the poster image below to find out more. Topic:"Water - much more than our most precious resource"
This is the most comprehensive course you can hope to do, with an all star line-up of presenters - including me! Permaculture City & Eastern Suburbs Group Christmas "Garden party"
Barrett House interior is still off-limits but we're invading the garden again for a casual wrap up get-together. BYO Everything! - food, drink, smile, chair, umbrella, banana lounge, portable swimming pool - whatever! See you there. Our three groups Inner West, City & Eastern Suburbs and St. George/Sutherland get together for our Christmas celebrations. 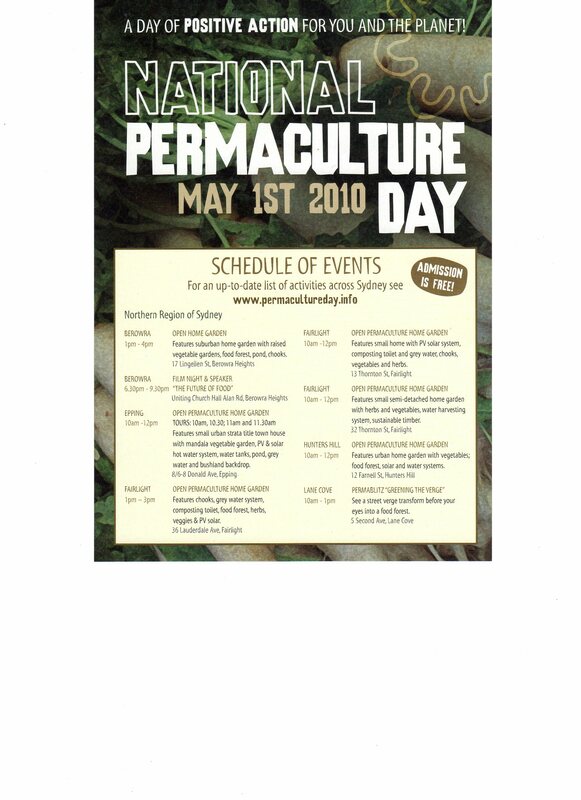 A great chance to meet like-minded Permaculture types and have a bit of fun and socialising. It's very near the Mortdale railway station so is easy to get to. Bring some festive food to share and any hard liquor you like (Sangria and soft drinks are provided). See you there! 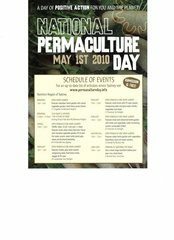 This is a special meeting for our group to take part in the concept design of a Permaculture Interpretive garden at the Centre. A great opportunity for members to learn and contribute their ideas. 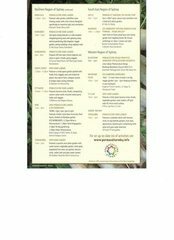 The Australian City Farms and Community gardens network is having their annual conference in Sydney on Thursday 12th and Friday 13th and in the usual Transition Sydney style it has invited several of their state leaders to join us for casual conversation over a meal and conviviality. A nice way to learn what others are doing and pick their brains in a relaxed setting. eLounge has a good range of Pizzas so your $15 entry includes a shared pizza meal (wine, coffee etc extra at own cost). Booking is essential as numbers are limited. Contact peter@transitionsydney.org.au or phone 0412 679 215 to reserve your place. Permaculture Teacher and Author and Transition Sunshine Coast initiator and prime mover Janet Millington is our special guest at this meeting. She and her co-convenor of Transition Sunshine Coast Sonya Wallace created and ran a ground-breaking course "Time for an Oil Change" which mobilised the local communities to get working on plans for sustainable and resilient futures in their districts and resulting in the world second "Energy Descent Action Plan". This is a great opportunity to learn from a real pioneer of the Transition movement. Fabulous presentation was done by Rosemary Byron on her passion - Australian native bees. Huge amount of learning about these lovely little critters, and much enthusiasm from our members - some of whom are already setting up native bee housing estates in their yards. This was followed by a tour of the Bunda street complex led by Fiona campbell of Randwick Council. 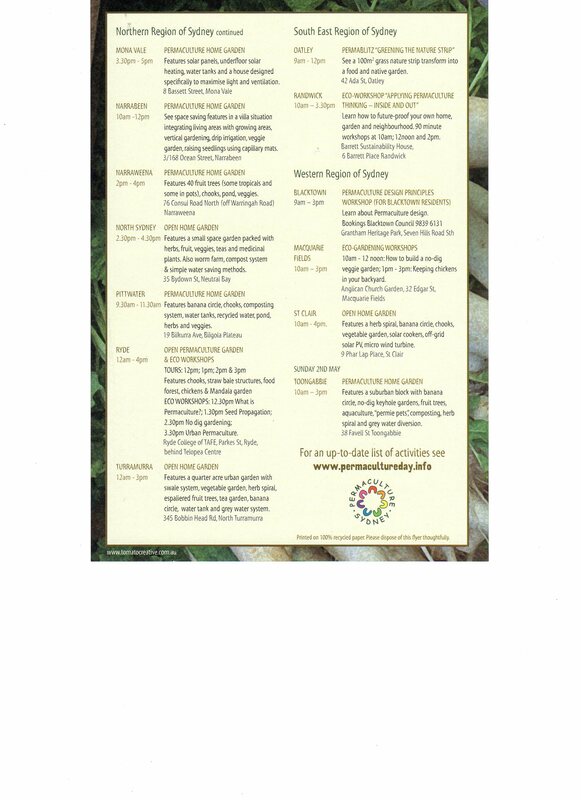 Great opportunity for our group to take part in a Permaculture Interpretive Garden at the complex was discussed.